We just got back from a fantastic trip to Fargo for the Unglued Craft Fest. I have visited Fargo on a number of occasions but had not fully explored the town so I wasn’t really sure what to expect for a turn out. This show knocked my socks off! People in Fargo are totally cool. First off, the Plains Art Museum where the event was housed is mega gorgeous. All elements needed for a cool craft scene were present: hardwood floors, tons of natural light, not a bad spot in the house, artwork on the walls, rooms for workshops, café, and space for live music to be played during the show. We love the community of artists in the Twin Cities but it was refreshing to see some new folks in another state. 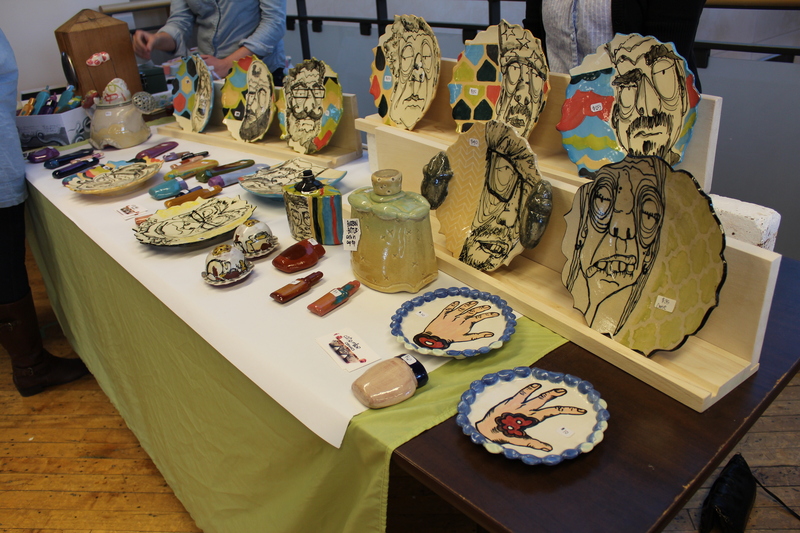 Catie Miller and Sarah George had unique ceramic plates available up on our floor. I’ve never seen anything like these before! I couldn’t help myself from coming away from the show with some goodies of my own. 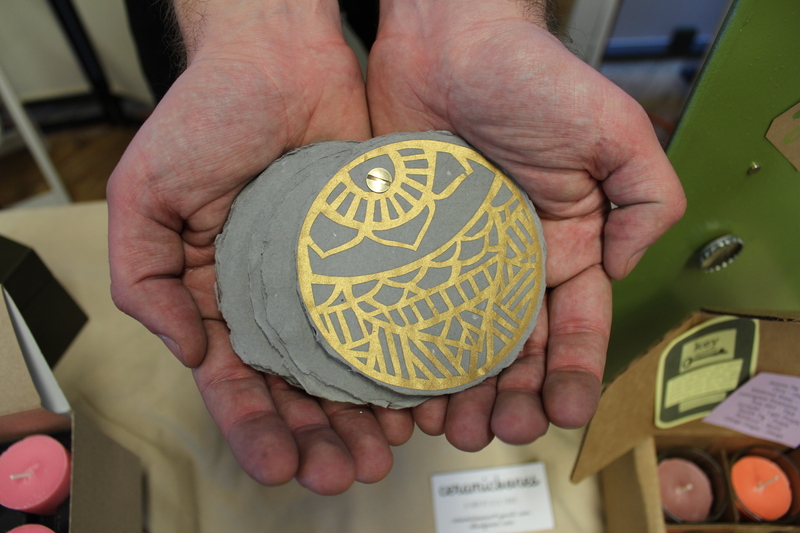 We got to make a product trade for this handmade mini book from Ceramic Bones. Neat! 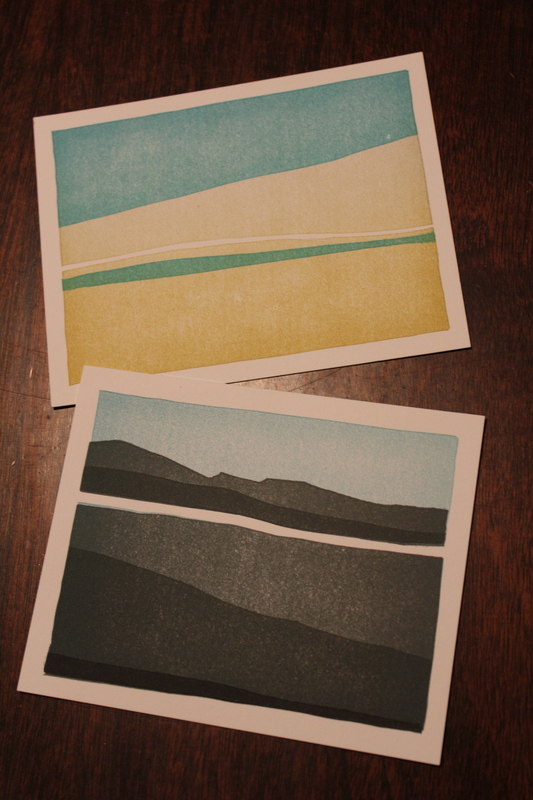 I was lucky to get my hands on these new Vandalia Street Press postcards! I am in a postcard club and I will be saving these for just the right person. 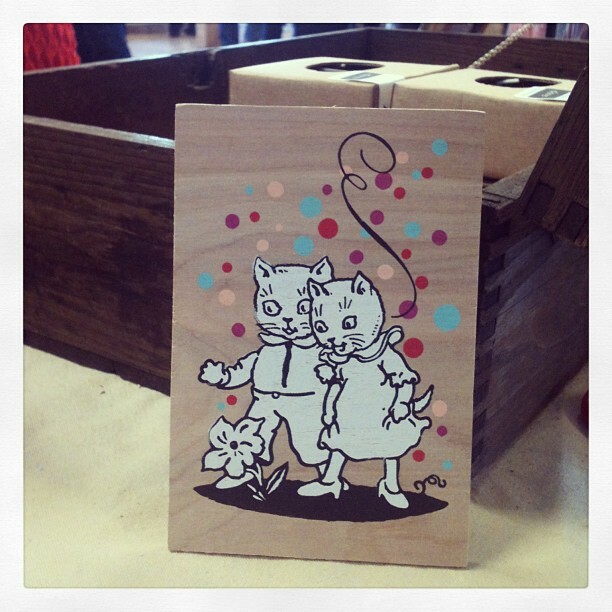 Out of all of the amazing items at Unglued I’ve gotta say that this tiny print by Amy Jo took hold of me. I walked past it on Friday and just had to buy it on Saturday before the show ended. I don’t know. I’m kind of obsessed with it. 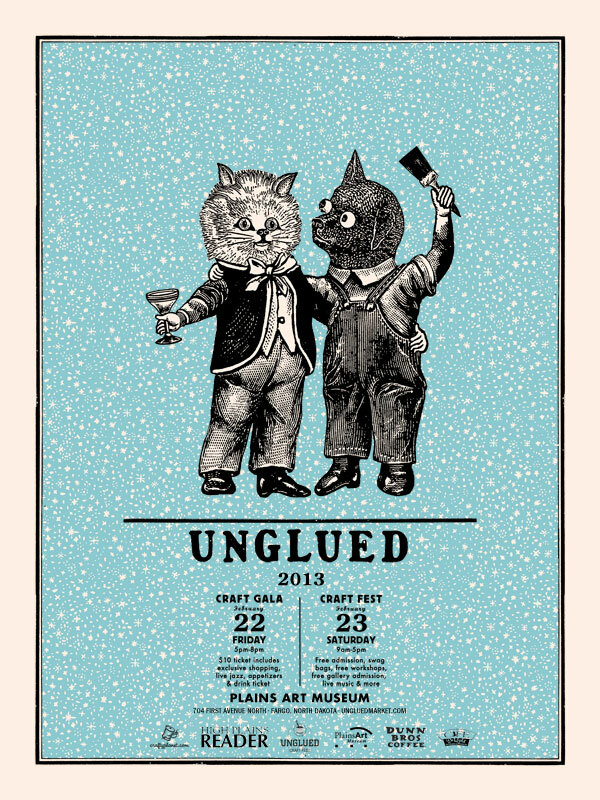 Amy Jo also printed the incredible poster for the show, which I also bought to add to our show poster wall. We were so lucky to be involved in this show. Way to go, Fargo. 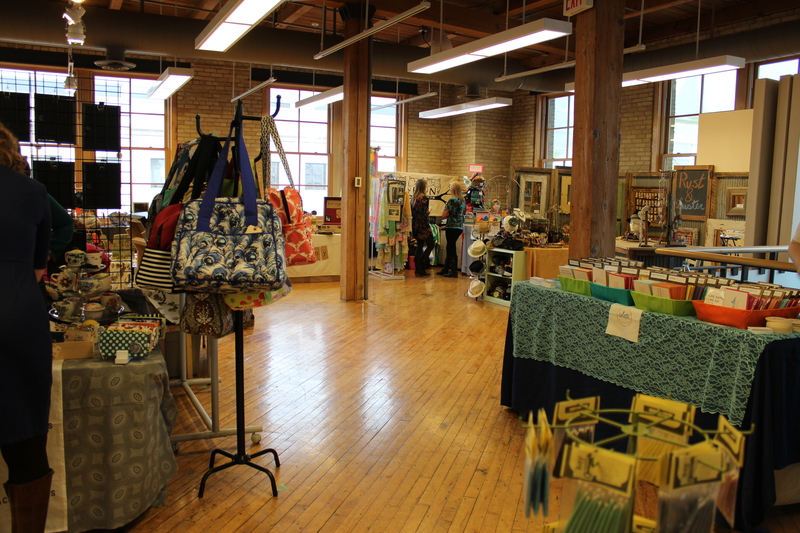 This week we’ve been getting ready for our upcoming craft fair, the Unglued Craft Gala and Craft Fest in Fargo, ND. This will be the farthest we have traveled for a craft fair. I think it’s funny that I’m scared to do an outdoor fair in case of weather but I’m willing to drive four hours in a snow storm for an indoor craft fair. Ya gotta love being midwestern. This is going to be an awesome fair! If you are in the Fargo/ Moorehead area you should check it out. As Etsy sellers, I knew there were beautiful candleholders hiding on the Etsy website. I found these holders recently and I was struck! I love how simple and natural they look. These tealight holders are made by Brooks Barrow in Alabama. The stones used to make these holders are from Wisconsin, our frosty state neighbor. They are sold individually or in sets and you can fill them with any colored tealight to make a beautiful display. Since the stones are natural, every set is different. It would be fabulous to mix these stones with other natural elements to make a centerpiece. Head over to Brooks Barrow on Etsy to see all of the styles they offer. Is it our second Thursday already? Time flies! Last week we talked about a holder for votives or tealights and this week we will focus on a fantastic taper candleholder. This beauty is handmade by Esque and it will put you back $300. This clear glass candleholder allows the wax that drips from a taper candle to decorate the inside of the container. Every time a person burns a candle into the container you will get a different result, meaning each item will be unique. In the past we made “drippy candles” that were supposed to drip. I’ve heard this was a really popular candle style in the 70’s. I think they are kind of fun! That being said, we pride ourselves on making 100% beeswax candles that do not drip! They wouldn’t work well in this holder. Still pretty cool though! 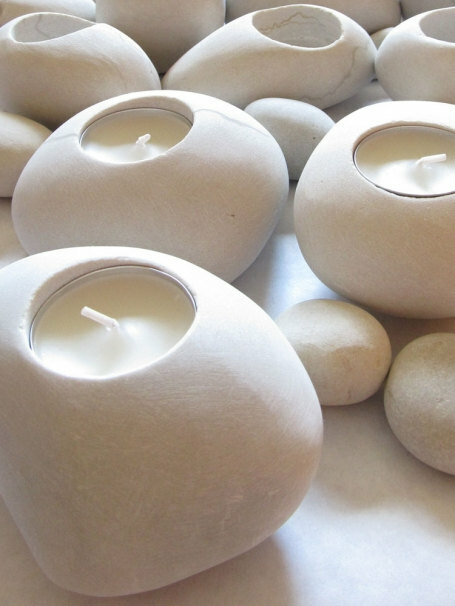 We have been making candles for a long time now and we have tried all types of materials. In the handmade candle store we used to work in we used mostly paraffin wax. We have chosen to use soy and beeswax for our candles because we appreciate that they are made without petroleum bi-products. We also like soy and beeswax because it is made in the US, unlike palm wax. We would like to use as many natural products as possible, while still making the best candles we can. With that being said, how do you all feel about the fragrances in your candles? We have been experimenting with pure essential oils for the fragrance in our candles but we have mixed feelings. The essential oils smell strong while they are burning, but not as “true” as the synthetic fragrances! Silly, right? Of course if we used only essential oils our price would need to go up quite a bit as well. We haven’t had a problem with the oils we were using before, and we trust that they are high quality, but we are trying to stay open minded. So, what is your opinion? Would you be more or less likely to buy candles made only with essential oils? How do you feel about wax? Today we start a new tradition on the Key Candles blog: candleholder Thursday! Beautiful and clean-burning candles are fantastic, but often it is the holder that pulls the look together. We hope to feature a style of candleholder each Thursday that we admire. This week has been so cold in Minnesota. It feels -29 degrees right now, so I feel like the following holders are appropriate. Today we feature a DIY ice candleholder made of ice by Christina over at Intimate Weddings. These would be fantastic at an outdoor winter event. Since this is a DIY project, there are so many things you could do to change the look of these holders. I would love to try making these with dyed water, plant pieces, or trinkets inside of the ice. We hope to keep up on sharing fantastic candleholders from now on. If you have any favorites, please send them our way.